Comments Off on Happy Thanksgiving. Click here to leave a comment. Are Private Jets Safer Than Commercial Airliners? The Big Three auto companies say they are. For good work on driving versus flying see Michael Sivak. Comments Off on But They Are Safer Than Driving…. Click here to leave a comment. Comments Off on No Improv Comedy Traffic School for You. Click here to leave a comment. Last week, at the ITS America conference in New York City, I finally got a chance to actually go for a ride-along in “Junior” (well, a clone anyway), the fully autonomous VW Passat designed by Sebastian Thrun and his colleagues at the Stanford Racing Team, which took second place in DARPA’s Urban Challenge. Mike Montemerlo, who appears in Traffic, was riding in the backseat, where he generated the visualization of our drive that I’ve posted above. The trip, down an blockaded and empty Eleventh Avenue, just outside the Javits Center, was absolutely unnerving. With a researcher from Volkswagen sitting in the driver’s seat, just in case something went wrong (it didn’t), the car drove a pre-programmed route for ten minutes, stopping at stop signs, navigating around hazards, and whisking back and forth before the assembled crowd. Its behavior — i.e., waiting for another (autonomous) car to fully clear the intersection before proceeding — was arguably better than most of what passes for driving in New York City. What if a barrel suddenly flew into the road, I wanted to know. The car would stop, and then figure out a safe way around the hazard. Junior lurched a bit here and there, particularly upon stopping and starting, but as Montemerlo noted, the robot was optimized for an autonomous race, without passenger comfort being a priority. But it was striking how quickly I adjusted to the experience, growing perhaps a bit too comfortable with the car’s steady hand, which leads me to believe a societal switch to autonomous driving (at least in certain environments) might not be as big a psychic hurdle as we imagine. Did driving in New York City have anything to teach Junior? Montemerlo noted that given the car’s usual home is Palo Alto, and is thus not so experienced with rain, the algorithms had to optimalized for the day’s wet streets. And again, the street was closed off — put it at the mouth of the Holland Tunnel on Friday afternoon and it might implode. The concentric bands you see around the car in the video, by the way, are the what the Velodyne High-Definition Lidar is “seeing” as it sweeps, ten times a second, in a 360 degree rotation on the roof of the Passat. You can also make out a number of pedestrians walking here and there. Note also the “target acquisition” the car makes as it approaches the fixed objects. The red bands represent things in motion. It’s hard not to summon The Terminator or some such when watching the video, seeing the omniscient power of the car to detect the array of objects in its path, able to calculate speeds and distance with unerring accuracy, while at the same time not feeling compelled to talk on a cell-phone or fix its hair in the mirror. Drivers, we’ve been warned: This is like Big Blue on wheels. Comments Off on Let the Bot Drive. Click here to leave a comment. Dave Johns explores the dark heart of honking — and imagines a world without it — over at Slate. We chatted briefly about the piece, and I told him I was reluctantly “pro-horn,” though I do wonder if it shouldn’t be disabled while the car is not moving — or would some driver someday need that horn to warn someone who was approaching them at speed while they themselves were stuck there, helpless? But as he concludes (after not finding much hard data on the subject — welcome to my world! ), it’s a people problem, not a technological problem. Comments Off on Honk If You Love to Read About Honking. Click here to leave a comment. Comments Off on Kids These Days. Click here to leave a comment. I’m delighted to note that Traffic has been named one of the “Top 10” books of 2008 both by Planetizen and by Library Journal. Oh, and also one of the “Top 10” Editor’s Picks (current events category) by Amazon. More to come, I hope! Comments Off on Top 10. Click here to leave a comment. That’s from a piece by industrial designer Raymond Loewy (who worked outside the Big Three), published in the April, 1955 issue of The Atlantic. He apparently wasn’t listening to Smeed. I suspect the safety gains have more to do with the cars themselves than with driver education. Comments Off on Raymond Loewy on the Future of the Car. Click here to leave a comment. …had me in mind of a paper I had recently read, “Reactance or acceptance? Reactions towards the introduction of road pricing,” by Jens Schade & Markus Bauma, at the Technische Universität Dresden, Traffic and Transportation Psychology, in Dresden, Germany; the paper was submitted to the journal Transportation Research. As an aside, I had the sense something similar was happening in the last weeks of the presidential campaign. As the Obama victory began to seem more and more inevitable, people who may have been firmly opposed or undecided suddenly shifted positions, either to match their attitudes with a seeming majority or because they did not want to seem left behind in some process of historical transformation (even in liberal Brooklyn I felt like I only really began to see a proliferation of Obama bumper stickers in the last weeks, or even after, the election). I’m not sure how this finding can be applied in any meaningful way to policy; some polls, of course, have found that a majority of New Yorkers already support pricing. Comments Off on Cognitive Dissonance and Congestion Pricing. Click here to leave a comment. 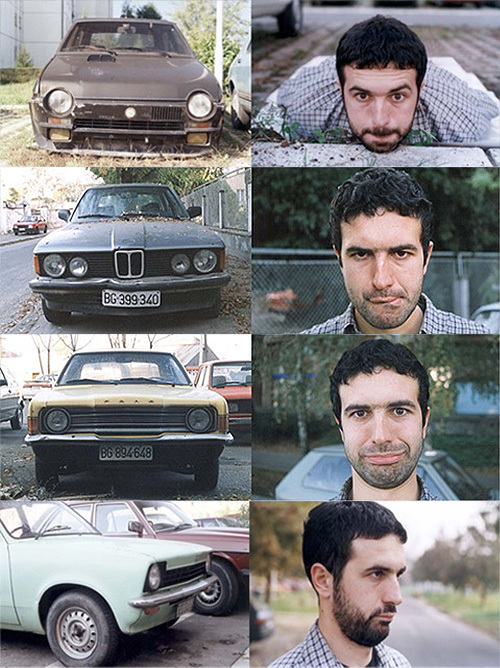 Via Things (and from here) comes this delightful set of photographs from Vladimir Nikolic in which he apes the “expressions” of a range of cars. The anthropomorphic (N.B., I can never say that word again without thinking of the hilarious job interview scene in Saxondale, the brilliant show with Steve Coogan as a former rock roadie turned exterminator that’s unfortunately not out stateside) nature of cars is really brought into high (comic) relief by Nikolic. 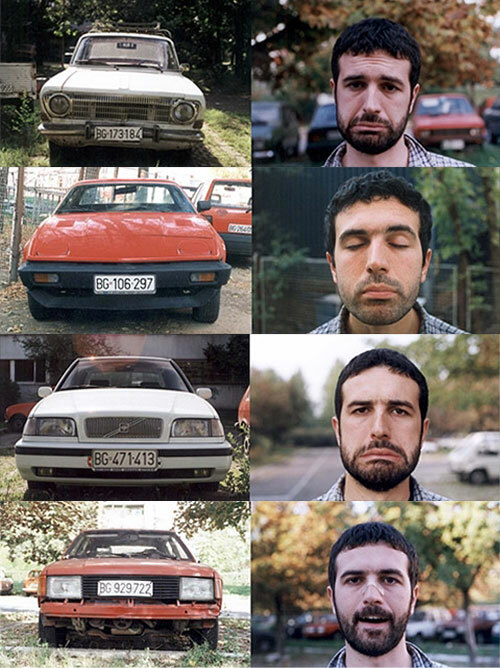 Comments Off on Car Face Revisited. Click here to leave a comment. For the uninitiated, the page essentially displays the raw data coming in from CHP units in the field (or via the calls that dispatchers receive) as they respond to a staggering variety of traffic “incidents” across the state’s vast network of highways — debris on the roadway (8:21AM LARGE PAPER ROLL IN # 2), vehicle fires, crashes, stalled cars, etc. They are read by traffic reporters, among others, not to mention the curious sorts (did I just implicate myself?) who spend their free time listening to police-band radio. One reason the CHP incident page so inherently fascinates me, as a reader of police procedurals, is that they too are written in the curious form police language. As with the above entry, it combines an exacting investigatory feel (the strange details like the “beer in her hand”; or in another entry, “WILL BE POSS HIT AND RUN, SIL SPORTS CAR, PLATE LAYING ON DASHBOARD, YPUNG MALE DRIVER, L/S TWD HACIENDA,” that ‘plate lying on dashboard’ is a somehow sordid detail out of Ross MacDonald) with a kind of sober professionalism in the face of the most astonishing events (like someone falling out of the car with a beer in her hand). Just the facts, m’am. I’m not sure if any screenplay ideas (or kernels) have ever been hatched from the CHP site (e.g., the car dealer who was run over by the car stolen from his own lot), but just watching the events unfold is to feel as if one is in the midst of a great narrative, driven by a sense of palpable urgency — for these dispatches can not only be crucial to someone’s life, but crucial to the flow of the highway. The “animal on the road” (typically dogs, often labs, and it’s really rather shocking how often it occurs — one thinks that dog owners, like drivers, should be licensed) that comes across in a CHP incident can disrupt the flow of thousands of lives. Horrifying, but, it turned out, not true — it was, rather, some piece of debris (and how many times have we struggled to make out, moving at high speed, some piece of detritus on the asphalt, ghoulishly conjuring a body that turns out to be a rolled-up carpet). Much of the information is like this, fleeting, grasping for details, and, often, merely a “phantom incident,” a bit of “noise” flicking the seismographic needle but not registering. But the reader barely has time to fill in the missing details in their head before another incident refreshes its way into view. Comments Off on “JAGU VS SCION VS RANGER VS VAN”: The Secret Window Onto California Traffic Life. Click here to leave a comment. As reported by the Austin-American Statesman, an Austin, Tx., woman went to court over receiving a ticket for making a right turn that, based on the signage, appeared legal. “Gilchrist asked for and was granted a jury trial on May 20 to fight her $185 ticket. Scott Cunningham, a TxDOT traffic engineer, said he testified before the jury that the placement of the state’s traffic sign on Lakeline Boulevard was misleading. A prosecutor argued that the straight arrow painted on the lane itself, along with the presence of the traffic island, was evidence enough that the lane was not a turn lane. Cunningham said state law dictates that traffic signs take precedence over anything painted in a roadway. Comments Off on Sign of Confusion. Click here to leave a comment. “The reason I finally quit the job I loved – driving big trucks – was that I didn’t want to kill someone. I realised that times have changed and the dangers were too great. Full story here or after the jump. Comments Off on A Trucker Says Goodbye to the Road. Click here to leave a comment. There have been any number of studies — the work of Warren Brodsky, for example — investigating the potentially harmful effects of driving while listening to loud music (particularly of a certain tempo). But a new paper by Mark Horswill and Annaliese M Plooy, at the University of Queensland, “Auditory feedback influences driving speeds,” published in the latest edition of Perception, talks about the risk of a car being too quiet. The problem is that noise — road noise, engine noise, etc. — acts as a form of feedback, helping to increase the driver’s situational awareness (described by Neville Moray as “shorthand for keeping track of what’s going on around you in a complex, dynamic environment”). 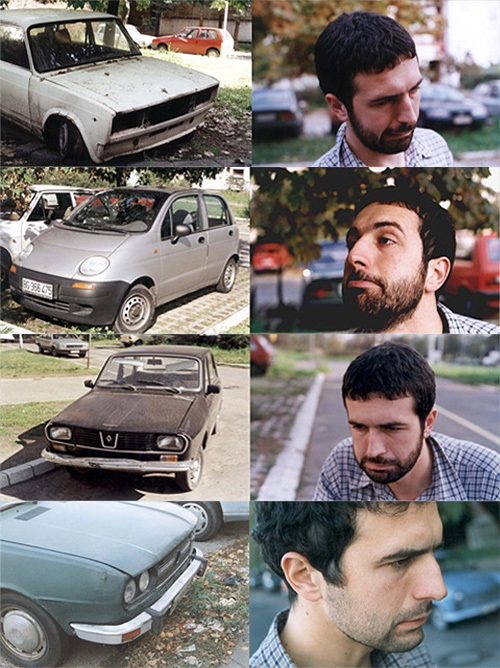 In his study, Horswill had drivers look at a variety of filmed driving scenes, which were played at a variety of different speeds and under different levels of audio “stimulus.” He found that ” reducing noise made vehicle speeds appear slower than they were.” When the decibel level was reduced by 5, the drivers thought they were moving 5 kph slower than they really were. You may be thinking that people can simply use the speedometer as the more accurate form of feedback, but previous studies have found people consult their speedometers rather rarely (“approximately 12 times over the course of a 6.4 mile, or 10.2 km, route” — this during a trial whose very task was to keep a set speed). The difference in speed may also seem minor, but given that small increases in speed at higher speed led to much higher increases in crash risk and damage, this may not be as minor as it seems. An observation once made in another paper (“The ironies of vehicle feedback in car design,” in Ergonomics by Guy Walker, et al. ), that “drivers’ self-awareness of the state of their own situational awareness appears to be very poor,” also seems to apply in this case: Drivers did not realize how the lack of auditory cues was influencing their own perception. To be cue-less is to be clue-less. Comments Off on The Hazards of Silence. Click here to leave a comment. The case has been made for the benefits (lower miles driven, more equitable pricing) of pay-as-you-drive insurance (“Pay-As-You-Drive Auto Insurance: A Simple Way to Reduce Driving-Related Harms and Increase Equity,” by Jason E. Bordoff and Pascal J. Noel of Brookings; report here). In essence, this system shifts the standard all-you-can-eat Las Vegas buffet that is automobile ownership (in essence, once you’ve paid for the car, you’re free to unthinkingly chow down on as many lane-miles as you’d like) to an a la carte system in which you will be charged for every nibble you take off the mobility menu. The lighter eaters will no longer be subsidizing the road hogs. This will be, among many other things, a fascinating social experiment writ large, with no small amount of room for possible unintended consequences, which are all addressed (if not exactly solved) in the report. “In all variants investigated, congestion on the road network is strongly reduced. 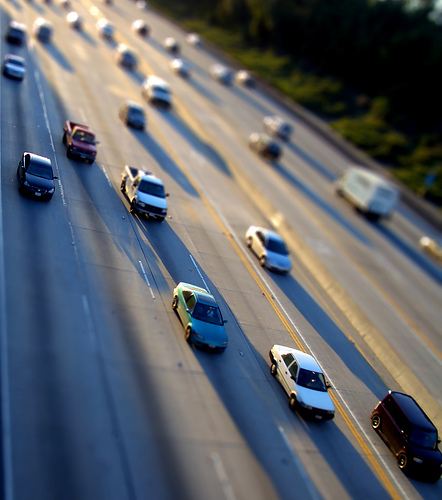 The decrease in vehicle loss hours is 20 to 60%. Even a price per kilometre without differentiation by time and place contributes to a reduction in congestion. Note that this refers to structural congestion. Total congestion reduction is lower because the price per kilometre does not affect incidental congestion (for example, as a result of a lorry tipping over and other accidents). privacy. The drawback to this solution is that software management may be complex. Comments Off on Pay-As-You-Drive Driving. Click here to leave a comment. 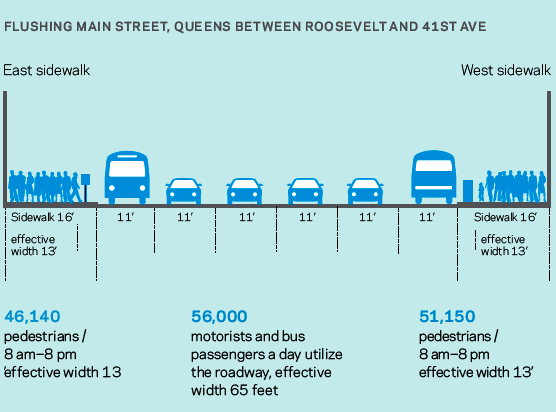 From Jan Gehl’s new report on New York City (via Streetsblog), this graph nicely depicts the typical (mis)allocation of New York City’s public space. We need hardly point out the glaring gap in negative externalities as well. Comments Off on Twice the Volume, One Third the Space. Click here to leave a comment. I just came across an article in the ITE Journal that speaks to some of the difficulties transportation engineers face in trying to manage and provide for varying modes of travel, particularly in environments where one mode dominates. The article, “Trial Implementation of a Leading Pedestrian Interval: Lessons Learned,” by Sarah M.L. Hubbard, Darcy M. Bullock, and John H. Thai, describes the installation of an LPI (that’s where pedestrians get the “Walk Man” a bit before drivers get the green, so that “peds” can establish their presence in the crosswalk, and also be more visible) in Anaheim, California, near Disneyland. While LPIs, at least in urban environments, have been found to be beneficial to pedestrians, at this location, the authors found, “the incidence of pedestrian compromise on the curb was found to be higher with the LPI signal timing than with concurrent signal timing for both low right-turn demand and high right-turn demand conditions.” In other words, things got worse for pedestrians with the LPI. 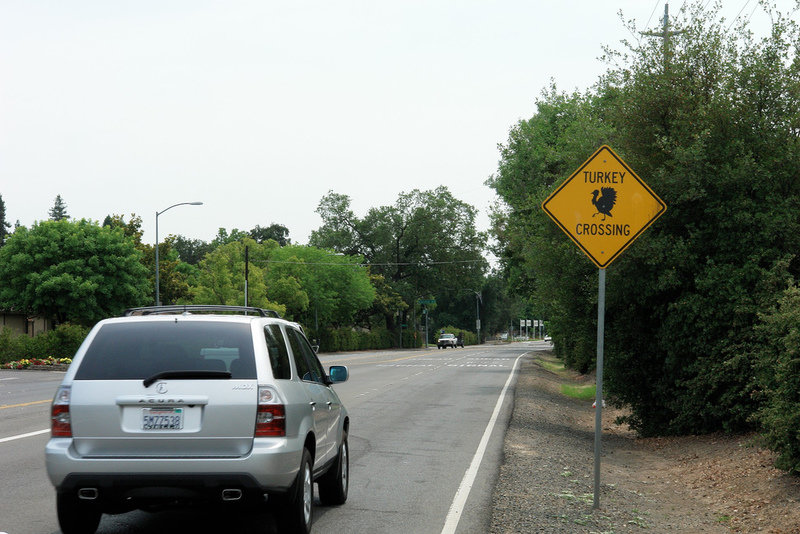 The culprit, they found, seemed to be the ability for drivers to make a right turn on red (yes, the only cultural advantage of California). “Drivers waiting to turn right at the red light are often watching for a gap in the oncoming traffic and may be unaware that the adjacent pedestrians have a WALK indication.” (One could get rid of the ROTR, of course, but that would, as the authors note, may cut right-turn capacity and could “actually reduce the service for pedestrians if drivers tend to accept smaller gaps between pedestrians and drive more aggressively as the v/c ratio for the right-turn movement increases” — in other words, the idiot factor may go up). What goes unsaid here, but what I think is a more general underlying factor, is the sort of larger modal blindness that seems to occur in more suburbanized areas, like the one in which the trial was conducted. Judging by the photos in the article, the major flow street has at least four lanes in each direction, and presumably some rather high speeds. The overwhelming feel of such environments is that they are made for cars; and indeed are filled with cars, to the extent that drivers become rather programmed to looking out for the things that are important to them as drivers — lights, stripes, other cars. Pedestrians waiting to cross at a major intersections may be the victims of a kind of blindness by the drivers — either an actual kind of “attentional blindness” (they’re not looking for pedestrians so they don’t see pedestrians), or a kind of cultural blindness by which pedestrians are marginalized, and lose the rights that have been extended to them (though the number of “crosswalk” stings going across in urban areas across the U.S. should reveal this is by no means a suburban problem). I’ve noticed in Manhattan that some of the worst places to navigate on foot are near any of the bridge or tunnel entrances — either vehicles are still used to being in less pedestrian heavy environments, or their proximity to “escaping from New York” leads to a kind of animalistic imperative in which the only consideration becomes getting that many inches closer to the tunnel — woe to the person who has to cross on foot in one of these situations. Comments Off on (mis)Leading Pedestrian Interval. Click here to leave a comment. You Can’t Dig Your Way Out of Congestion? The Boston Globe reports that post-Big Dig, bottlenecks in the Boston region, while lessened downtown, have been shifted outward — perhaps a result of more people now choosing to drive through the center of town. Comments Off on You Can’t Dig Your Way Out of Congestion?. Click here to leave a comment. Men do drive more miles, of course, and I’m not sure if this was corrected for in some way (women may drive recklessly but their exposure is lower, so less chance of being caught; or maybe male traffic cops really are less likely to issue tickets to women — after all, as this study by Michael Makowsky and Thomas Strattman found, “ceteris parabis, young females have the lowest probability of receiving a speeding ticket”), but the gender difference seems much larger in any case than any mileage discrepancy. Comments Off on Driving While Male. Click here to leave a comment. Networks guru Anna Nagurney (my kind host yesterday at Amherst), lends a valuable historical perspective in a letter in the Economist, in response to their article on routing inefficiencies in road networks. SIR – It may be of interest to your readers to know that it was actually economists who first figured out that an individual’s selfish behaviour when selecting an optimal travel route would yield different traffic flows and times than if one were to assign flows in a centralised manner to try and minimise the cost to society (“Queuing conundrums”, September 13th). Arthur Pigou wrote “The Economics of Welfare” in 1920, by which time he was well aware of the distinction between different traffic behaviours. Curiously, traffic and queuing problems keep on getting (re)discovered by different disciplines; now it seems to be the turn of the physicists. Comments Off on Selfish Commuting, Redux. Click here to leave a comment.